pSemi (formerly Peregrine) has expanded its digital step attenuator (DSA) portfolio with a family of value, high-performance DSAs. The four value DSAs feature industry-leading attenuation accuracy at an entry-level price point and were introduced at IMS 2018. 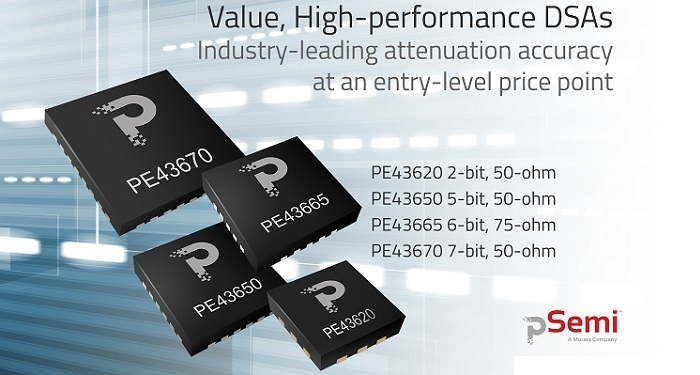 The value DSA family—the PE43620, PE43650, PE43665 and PE43670 - are offered in a 2-bit, 5-bit, 6-bit or 7-bit configuration. These high-performance DSAs have excellent attenuation accuracy, low insertion loss and high linearity. The four products are available in compact QFN packages. For 1K-quantity orders, the PE43620 DSA (2 bit, 50-ohm) is $0.63 each; the PE43650 (5 bit, 50-hm) is $1.44 each. The PE43665 (6-bit, 75-ohm) is $1.23 each, and the PE43670 (7-bit, 50-ohm) is $2.02 each. Volume-production parts, samples and evaluation kits will be available in August.